The number of single-family homes and condos that traded hands across the greater Bay Area totaled 5,341 this past December, that’s down 13.2 percent from November (versus typically ticking up), down 21.6 percent on a year-over-year basis, and the lowest December sales total since 2007, which marks another 11-year seasonal low, according to recorded sales data from CoreLogic. 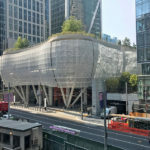 In San Francisco, recorded sales totaled 363 this past December, that’s a 27.1 percent drop from November (versus typically ticking up), an 18.8 percent drop versus December 2017 (while inventory levels were an average of 50 percent higher at the end of last year) and a ten-year seasonal low. And as we first reported last month, we’re projecting January sales will be even worse. On the eastern side of the Bay, homes sales totaled 1,202 in Alameda County, down 18.6 percent on a year-over-year basis, sales in Contra Costa County totaled 1,094 (down 22.9 percent), and sales in Solano County totaled 445, down 27.3 percent versus the same time last year. Down south, home sales in Santa Clara County totaled 1,145 this past December, down 24.6 percent on a year-over-year basis, while sales in San Mateo totaled 407, down 27.7 percent versus the same time last year. And up north, home sales in Napa totaled 105 in December, down 18.6 percent versus the same time last year, sales in Sonoma totaled 448 (down 7.4 percent), and sales in Marin totaled 177, down 20.3 percent on a year-over-year basis. The median price paid for those aforementioned 363 homes in San Francisco was $1,325,000 in December, up 1.9 percent from the month before and a mix-driven 14.2 percent above its mark versus the same time last year. The median sale price in Alameda County ticked up 2.3 percent to $834,000 in December and was 9.2 percent higher versus December 2017; the median sale price in Contra Costa County dropped 4.6 percent to $570,750 but remains 3.8 percent higher on a year-over-year basis; and the median sale price in Solano County was $415,000, up 9.9 percent, year-over-year. The median sale price in Santa Clara County dropped another 4.8 percent in December to $1,000,000, which was even with December 2017, while the median sale price in San Mateo County shed another 3.0 percent to $1,250,000 but remains 4.1 percent higher on a year-over-year basis. The median sale price up in Marin dropped 1.8 percent to $1,015,000 in December but remains 6.8 percent above its mark at the same time last year. The median in Napa ticked up 4.9 percent to $635,000, which is 1.2 percent lower on a year-over-year basis and the median sale price in Sonoma ticked up 2.4 percent to $595,000 but was 3.1 percent lower versus the same time last year. And as such, the median home sale price across the greater Bay Area, which, in fact, has been trending down, dropped 3.7 percent in December to $785,000, which is 4.6 percent above its mark at the same time last year but now 10.3 percent below its peak of $875,000 which was set this past May. Keep in mind that while movements in the median sale price are a great measure of what’s selling, they’re not necessarily a great measure of appreciation or changes in value and are susceptible to changes in mix, especially as sales volumes drop, as opposed to movements in the Case-Shiller Index. Got it, I thought when the headline said “11 year low” it would mean the lowest in 11 years. But that’s not what you mean. The headline, “December Bay Area Home Sales dropped to an 11 year low” would more clearly communicate what your 65 word lead sentence aspires to convey. As for the topic at hand, I find the data on the home sales market consistent with the broad securities market selloff that also occurred in December. I don’t believe much of the recovery rally that has happened in the stock market since and I expect continued soft home sales in 2019. If you haven’t bought a house but plan to, wait 6-12 months until more sellers understand the market has weakened. We haven’t seen that many ‘bargains’ yet. That securities market selloff must have been a real doozy in December and telegraphed back in 2016. 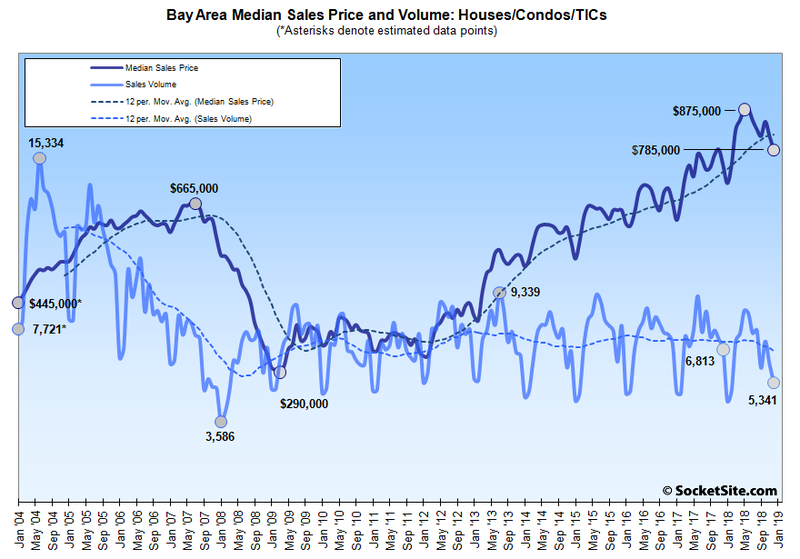 Bay Area home sales have, in fact, been on the decline for two years (down 9 percent from 2016 to 2017 and down an additional 4 percent in 2018), during which the securities market has gained over 15 percent, not including any of the rally since the start of 2019 (nor even the last days of 2018). And in terms of “bargains,” a growing number of recent sellers might disagree. Exactly the dynamics here that you’d expect from a cycle. Prices have weakened, inventory is up sharply (+50%!!) but yet sales are down. If a department store drops prices 30% that is meant to, and usually does, spur increased demand. If prices for a good rise 30% demand usually falls. Increased demand tends to push prices back up while decreased demand tends to drive prices back down. It’s easy to see how this ‘first order’ behavior is stabilizing. Market response to a price movement tends to drive that price back to it’s previous value. But obviously prices can’t shoot up to infinity so at some point this process has to stop and then reverse. Falling prices leads to falling demand which feeds back into further falling prices. A while back, people argued that we were in a classical ‘first order’ situation and that there were ‘buyers on the sidelines’ that would swoop in and correct any dip in prices. Or that buyers were simply limited by inventory. But now we’ve seen prices weaken and inventory shoot up and contra to what those people expected sales are actually down. Exactly what you would expect in a highly cyclical market. Prices haven’t dropped very much though, and in many categories they’ve not dropped at all. I think volume/inventory is more relevant to Realtors/brokers. So for them, the market is way down. I wonder if/when price will slip. What’s ‘much’ and in which categories do you think they’re up? I looked at Glen Park, Noe Valley, and Bernal Heights single family home dollars per square feet the other day, 2014-2018. Glen Park($895/ft 2014 – $1236/ft 2018) and Bernal Heights ($816/ft 2014 – $1078/ft 2018) have seen unimpeded climbs. Noe Valley went from $1021/ft in 2014 up to $1241 in 2015, down to $1157/ft in ’16 and then back up to $1240 in ’17, staying basically there at $1236 in ’18. I stopped there. I suspect Potrero Hill and the Mission would show similar values YoY. And I suspect that Vis Valley, Portola and Ingleside will show very steep climbs YoY, possibly with flattening between ’17 and ’18. Probably the Sunset will look similar too. Other than the Mission, these are areas with mostly single family homes and relatively easy southward commutes. I don’t see any price weakening. 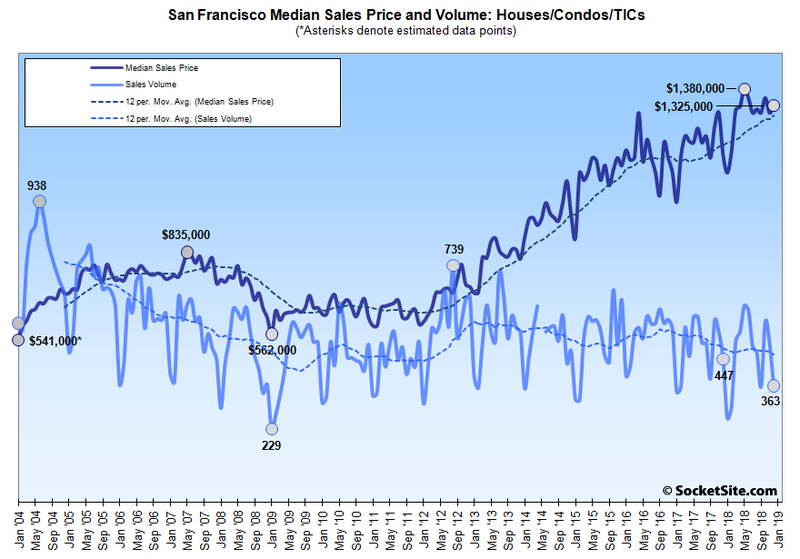 I see Noe Valley finding its ceiling and kind of lingering there, having surmounted a cw in 2016 that $1200-1300/ft was a thing of the past. I think 2019 year will be very interesting year to say the least. So I looked into it. The Mission SFR market is not down since 2015. It is up. 2014 $810/ft , 2015 $992/ft, 2016 $1005/ft , 2017 $1010/ft, 2018 $1011 ft = all with a similar ~30 sales sample size. Where did you get the idea that the Mission would definitely be down? 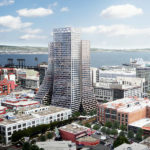 The luxe condos on Valencia? I’ve stayed talking about SFRs, here. The initial point was about categories. A few of things to keep in mind: single-family home sales represent the minority of the market in San Francisco; the single-family home market tends to be a lagging, not leading, indicator of market strength; when the housing market slows, the mix of what sells starts to change (higher quality sells; lower quality languishes); and with the market not turning until late 2015, measuring total appreciation from 2014, which was a particularly bullish year, can really muddle two-point plots, averages and conclusions. Now the Sunset, 2014 483 sales $668/ft, ’15 410 $761/ft, ’16 397 $808/ft, ’17 402 $892/ft, ’18 384 $967. Data points from the slowest times of the year are not so informative, are they? Only desparate sellers would unload a home at this time of year. It’s going to be much more revealing to watch the peak selling season. On a macro basis, the US economy remains very strong, and employement is at all time highs (100th straight month of increases). Once Brexit is resolved one way or another and there is some clarity on the trade situation, equities are free to move higher (SP500 has a forward PE of 15.75 today, so there is meaningful room for increases). Locally, FB is bringing in probably 5-10k very high paying jobs to SF over the next 24 months. In summary, I see prices leveling or softening but still historically very strong. Those who are hoping for widespread bargain prices will be sorely disappointed. Individually? Not so much. Collectively? Yes, they are. Sales in San Francisco were down an average of nearly 7 percent on a year-over-year basis in the second half of 2018, having already dropped an average of 12 percent from the second half of 2016 to the second half of 2017. In terms of Facebook’s direct impact, care to guess how many employees currently commute from San Francisco to Menlo Park but will stop commuting over the next two years? To be counted as sold in December, these would have to go in contract in November, correct? Mortgage rates didn’t start to soften until December.